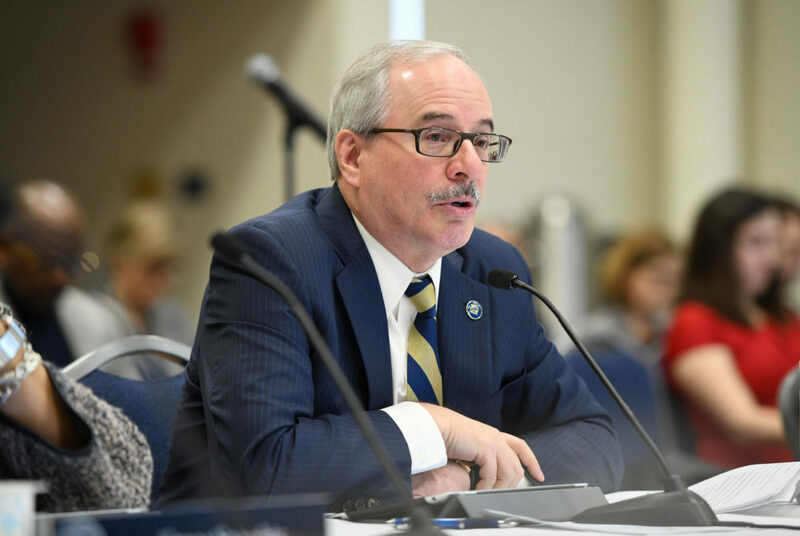 University President Thomas LeBlanc said officials “underestimated the amount of dollars a student needs" to eat for a semester in Foggy Bottom. Students and officials applauded the move to boost student dining dollars next academic year – announced Friday – as a major step to ensure students don’t go hungry on campus. The Board of Trustees approved a new meal plan at its meeting Friday that gives students significantly more to spend on food, hiking dining dollars to $4,600 for students without kitchens and $2,800 for those with kitchens in their residence hall rooms. Student leaders and experts said the change would help alleviate the anxiety students face in budgeting meals, but that more steps need to be taken to address broader concerns about food insecurity and the high cost of eating on campus. Currently, the amount a student receives on their dining plan is dictated by their academic year – $4,100 for freshmen, $2,700 for sophomores, $2,200 for juniors and $1,200 for seniors who live in on-campus housing – amounts many students have said isn’t enough to afford to eat in Foggy Bottom. The new set up is the first time the meal plan will be linked to whether a student has an in-unit kitchen. The change comes after food insecurity ascended to the top of student concerns and LeBlanc’s agenda this academic year as part of an increased focus on the student experience. LeBlanc said officials “underestimated the amount of dollars a student needs to eat for a semester here on the Foggy Bottom Campus” and realized that having a kitchen has a major impact on how students budget dining money. LeBlanc said officials will monitor the progress of the meal plan after one year and may change the program next year if students don’t respond well to the system. The announcement comes as the University seeks to implement an all-you-can-eat dining hall on the Mount Vernon Campus next academic year. LeBlanc said having a pay-per-meal dining hall on the Vern would encourage students to visit the campus and offer a more affordable dining option than restaurants and vendors in Foggy Bottom. Dining is a central concern students face living on a non-traditional, urban campus and was an issue raised repeatedly in town halls and meetings with student leaders on the quality of student life on campus last semester, he added. For years, the meal plan has been among the chief complaints students have voiced to officials. The new plan will contribute to a 3.9 percent hike in the cost of attendance next year – an increase larger than in recent years when officials have sought to limit price increases to tamp down affordability concerns. Officials said an increase in financial aid – to be announced later this spring – will help cover the added expense. Provost Forrest Maltzman said the current dining plan “does not make a lot of sense” and he has had trouble in the past explaining why the University sets up its dining plan as it does. 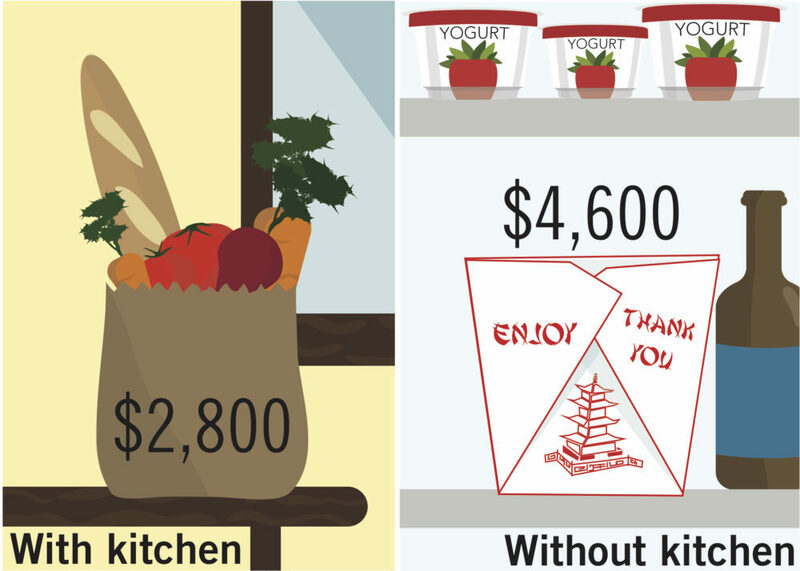 “The pattern is clear that those who have kitchens and those who do not have kitchens eat and spend money differently, and that is a much better indicator of how one spends than whether one is a freshman, a sophomore, a junior or a senior,” he said. The rise in dining dollars also follows an increased student focus on food insecurity over the past two years. After the University closed Foggy Bottom’s only dining hall and opted for an “open” dining plan in 2016, students said last year that the plan still didn’t afford students enough money to eat a healthy or adequate diet each semester. Last spring, officials added $200 to each dining plan amid affordability concerns. In 2016, officials also opened GW’s food pantry – coined “The Store” – which more than 600 students have signed up to use since it became available to the public. Last week, the Student Association passed a resolution calling on the University to increase the amount of dining dollars afforded to students and to re-evaluate its discounted meal program to include more healthy and cost-effective options. The resolution was a response to a Food Institute report that found the University’s own advice on how students can navigate the meal plan doesn’t give students enough to eat. Logan Malik, the SA’s director of sustainability policy, said that while the change is a “step in the right direction,” there is still more work that needs to be done, like the successful implementation of an all-you-can-eat dining hall on the Vern and an increased focus on making Foggy Bottom food more affordable. “We’re still ignoring the fact that the price for food on campus just in general is quite high,” he said. SA Sen. Will Raderman, U-at-Large, who sponsored Monday’s resolution, said that while LeBlanc deserves “props” for recognizing food insecurity as a prominent issue on campus, officials need to revamp meal deals, a program that offers students discounted meal packages. Student leaders have complained the program isn’t well-known among students and doesn’t make it substantially easier to afford meals. Dining and food insecurity experts said the change will need to be monitored over the next year, and that officials may need to explore more affordable food options to ensure the new plan’s success. Greg Wolfe, the business manager and director of purchasing at Stonehill College in Massachusetts, said it makes sense to rely on the financial aid office to give money to students who may be struggling with food insecurity because they know the monetary needs of students best. But he said that regardless of the plan, students will eat what they have always eaten, which is why universities must offer several options for students. “Students, relatively speaking, are going to eat what they eat, so if you’re a light eater as a freshman, most likely you’re going to be a light eater as a senior,” he said. Clare Cady, the co-director and co-founder of the College and University Food Bank Alliance, said it’s not uncommon for universities to allow students to lower their dining plans if they have a kitchen in their room. But officials’ main concerns should be whether students can use that money to eat properly in an area where the cost of living is high, she said. “If you want students to be able to afford to eat, you need to make sure that the way you’re delivering food to them is an affordable way of getting food,” she said. Annie Dobler, Andrew Goudsward, Caitlyn Phung and Meredith Roaten contributed reporting.